The essential “ecosystem services” that ecological processes provide include: the pollination of our crops, pest and disease control, clean air and water, soil formation and the mitigation of environmental hazards such as erosion and flooding. However, despite their importance to the health of both humans and the natural environment we rarely place a value on ecological processes, often taking them for granted until they break down. 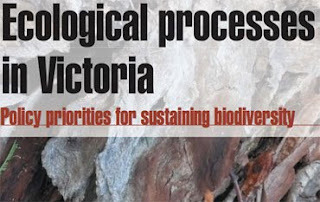 ‘Ecological processes in Victoria: Policy priorities for sustaining biodiversity’ (2.7MB, PDF) is a discussion paper that attempts to shine a light on ecological processes, looking at what they are, why they are important, and how we can incorporate their management into conservation strategies.